The trip in Burma started with a cockroach so it seemed only fitting that it should end with one, too. On the first night in Yangon, my roommate and I bonded over a mutual dislike of these unsavoury creatures. With me brandishing the water jet (thank goodness they have those in the bathrooms in SE Asia) and Gesa gingerly lifting the toilet seat as she shouted “die, die” we rid the bathroom of pesky creature number 1. Or at least we thought we did. Because it was in the same hotel 2 weeks later that pesky creature number 2 was spotted, again in our bathroom. Apparently our squeals could be heard several rooms down the corridor. (Not even going to pretend that we were cool about this). Maybe it was the ghost of number 1? Either way, his life ended rather brutally by being crushed in half by the only weapon we had, a coffee cup. In fairness, mosquitos apart, we had very few insect issues other than the odd leech when we were walking in Kalaw. Which is where we were headed when I finished the last post. 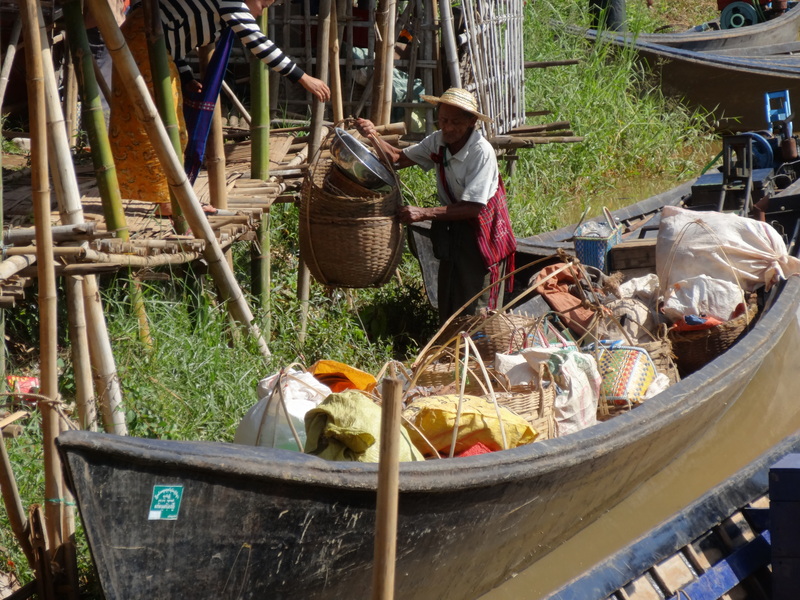 From Mandalay we travelled into Shan State and to rich fertile lands around Kalaw, from where approximately 60% of Burma’s fruit and vegetables are produced. 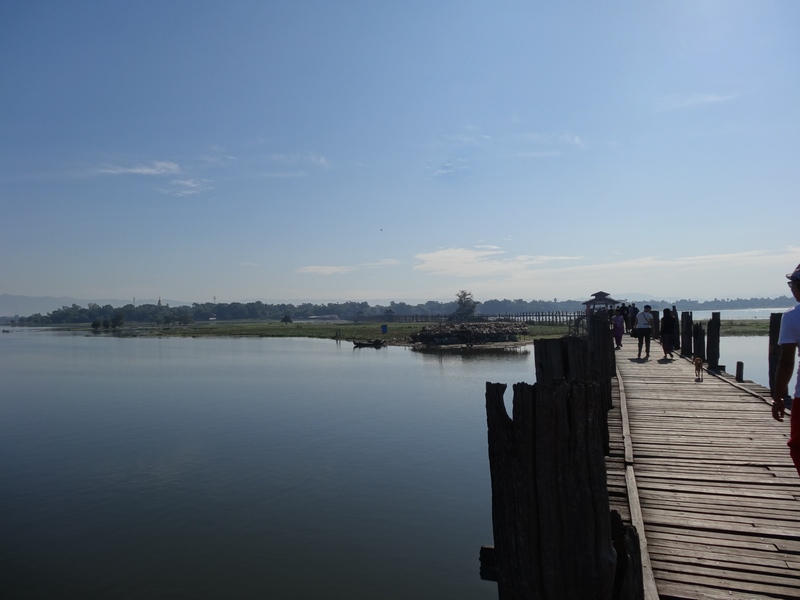 En route, we stopped at the iconic U Bein’s Bridge, a teak causeway renown for the early morning journeys made across it by the monks (I didn’t get up early enough to see that, but others did). At first blush you could be forgiven for mistaking the countryside for parts of Britain. It was only on closer examination of the rolling fields and hills that you realised the ground was being ploughed with ox and cart, and once you were in the fields that you took in the wide and varied produce that our climate just wouldn’t ever sustain – we saw tea plantations, coffee, avocados, mandarins, orange groves, banana trees, lime trees, egg plant, fields of cauliflowers (I am so over cauliflower right now, I think it has been in every meal for the last fortnight). 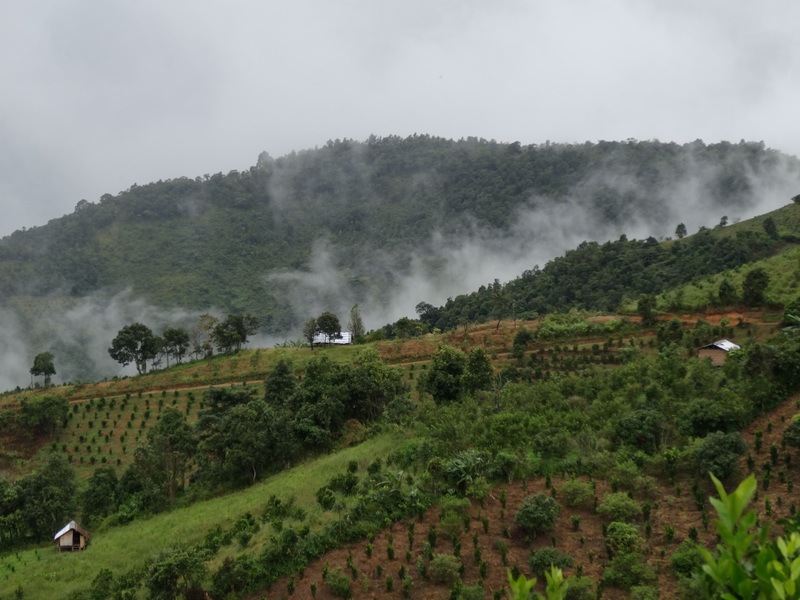 Kalaw was beautiful. We hiked through the fields in the rain led by a local guide, passing by a local monastery and stopping in a village for lunch made from local vegetables cooked by his friends. I realised how much I have missed exercising – we walked about 10k over the course of the day and I felt the best I had all trip. 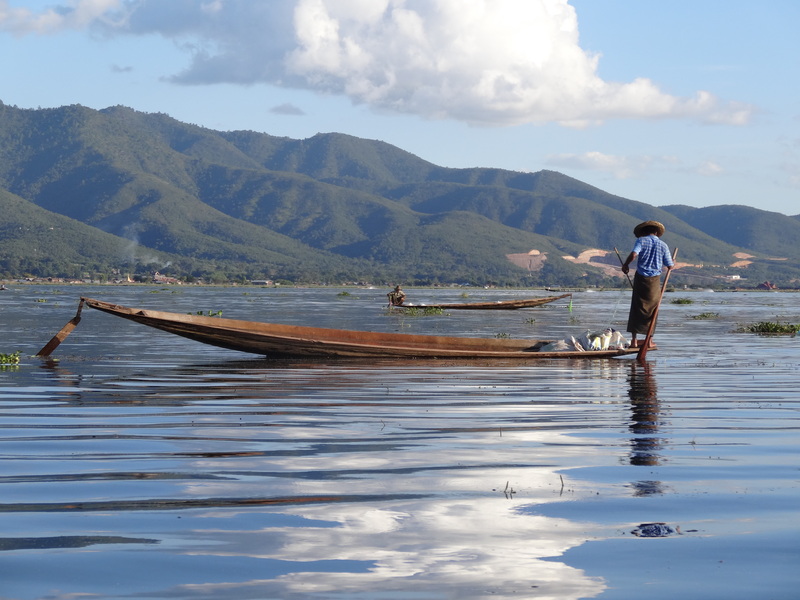 After a couple of nights there we headed to beautiful Inle Lake where we spent our first day exploring the lake by boat. 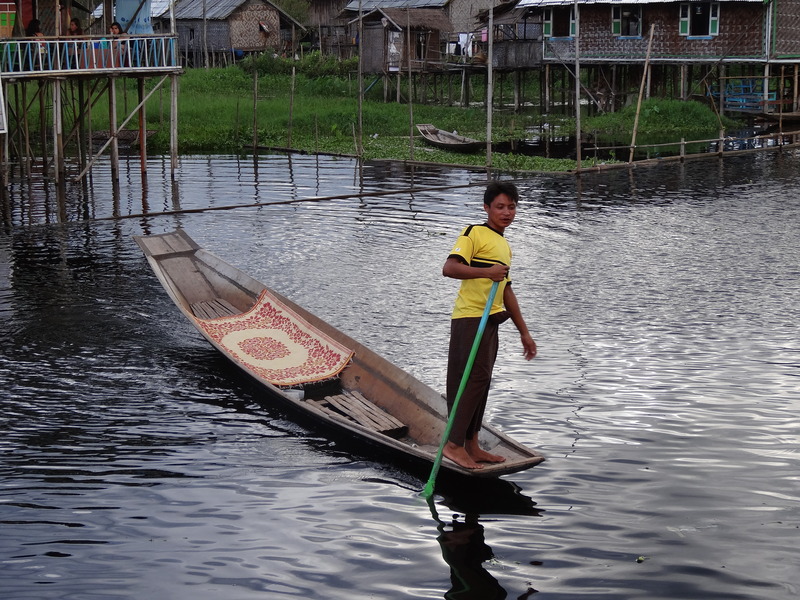 There is much to see – pagodas, floating markets, local industries – weaving with silk and lotus thread from lotus stems on the lake, ironmongers, silversmiths. Our day was full and as we proudly showed off our silver jewellry that we had bargained for at the market, it took our guide to burst our high quality negotiating bubble by pointing out that our “silver” was in reality likely to be a combination of copper and lead. 2 days later and my finger is already green, go figure…..
That evening, a few of us went for a drink at a local beer station. As we sat in the bar I had my first, massive stab of homesickness. It was the day of the rugby internationals (no, it wasn’t the sight of the rain that made me feel sad), and I knew it meant that my parents would be at my house before going to the game (Mum I hid anything interesting so no point looking). Man United v Crystal Palace was showing on the TV in the bar. As the teams were led out onto the pitch, there was a military guard of honour, and I remembered that it was Remembrance Sunday the next day. The Last Post sounded, there was a minute’s silence and I suddenly realised that tears were rolling down my cheeks. My group had no idea what had gone on and looked very alarmed until I explained. It felt particularly poignant as I have seen countless pictures on Facebook of the magnificent fields of poppies at the Tower of London. I am so glad I got to see those – although some time ago so sadly not in their full glory. The next day was a free day. I went in search of wifi which meant sitting on the benches outside our hotel. There was a wedding taking place that day so locals started arriving as the morning progressed. At first I was a little unnerved by numerous local men standing over me, taking turns to either stand over or sit next to me. Then it dawned on me that they were intrigued by my laptop. They were looking at it from all angles, just watching me as I sorted through some photographs, unashamedly looking at the pictures. My attempts to engage with them were thwarted by the language barrier. Then the wedding party arrived and the bystanders lost all interest in me, surrounding the bride and groom to receive an envelope that they all hurriedly opened to see how much cash was inside. I never worked out if these people were invited guests or not. Our guide was explaining to me that the tradition is that people get in the way of the progress of the bride and groom, hence the payment to let them through. After that excitement I went cycling with some of our group. We headed out to the local vineyard for a wine tasting. The white was quite drinkable, but the red, as one of the group so eloquently put it “was quite hard work in the mouth”! The views from the vineyard were spectacular and worth the ride in itself. We rode on from there to the next village and as we headed off I took the lead. I was trying to understand why the motorcyclist coming towards me was headed straight for me until I heard the guys behind me shouting “cycle on the right Sharon”…. Ah yes. Not in England now. 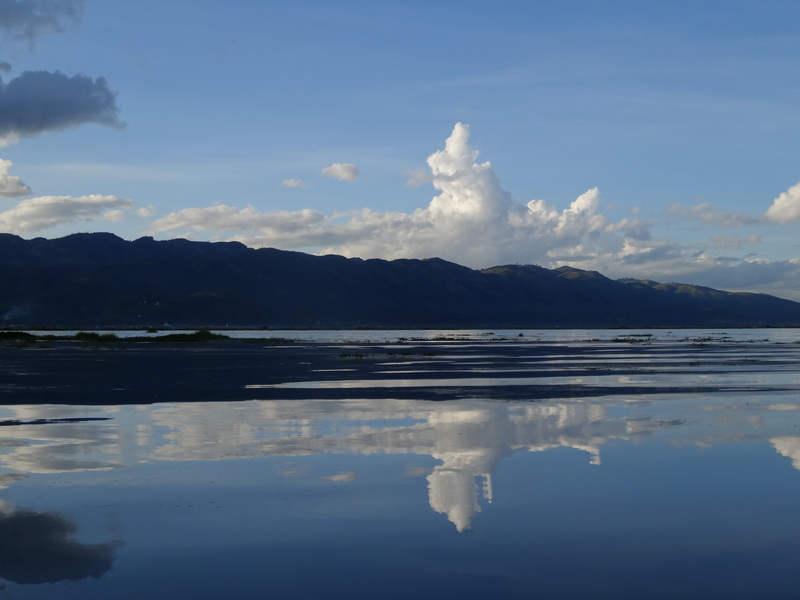 The village we were headed to was on the shores of Inle lake and we went in search of a beer. Parking up the bikes, we walked down a long teak bridge along on of the inland waterways and found a bar…on the other side of the water. Not to be thwarted in his quest to sell us a drink, the bar owner came and fetched us in his boat and we wobbled our way across for our liquid reward. 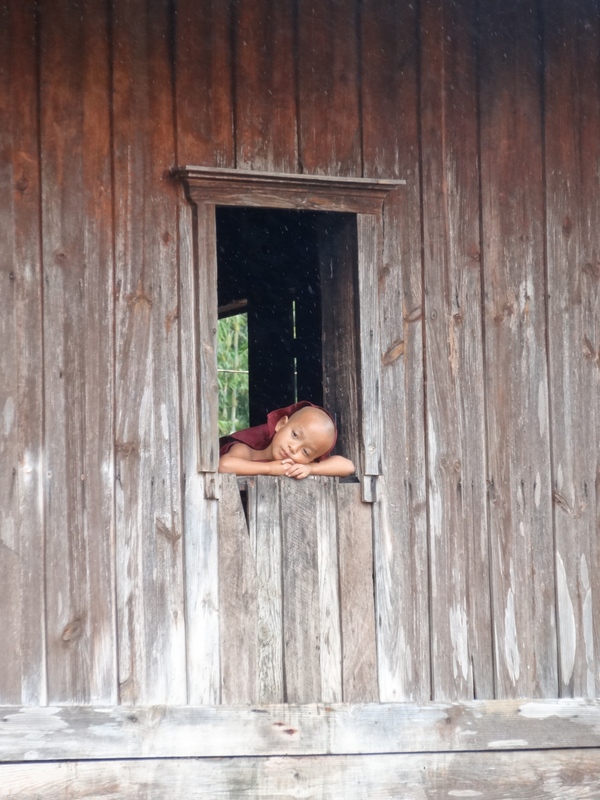 And so the Burma adventure has drawn to a close and it is time to reflect again. I have gone through some really mixed emotions during this trip. Elphaba (see previous posts) was right – the food is pretty dire and you do see a lot of temples. But you cannot fail to be awestruck by the vast majority of them, particularly in Bagan. The country is stunningly beautiful, which is just as well as the group I was travelling with did not seem to gel (with a handful of exceptions including my lovely roommate) and so I never really relaxed and found my mojo. My initial experience in Yangon apart, the people are peaceful, friendly and welcoming – as we cycled along yesterday the guys taking shade under the trees, passing by on their mopeds, all called out “mingalabar” (good day) as we or they passed. They are intrigued by westerners, during the course of the trip we had to pose several times for photographs with the locals, and some would even come up and touch our skin. Our guide even told us a story about how he and his friends as children growing up in a small village once followed a westerner to where he had been to the toilet (in the bushes) to see if his poo was the same colour as theirs, given that he was so fair-skinned. 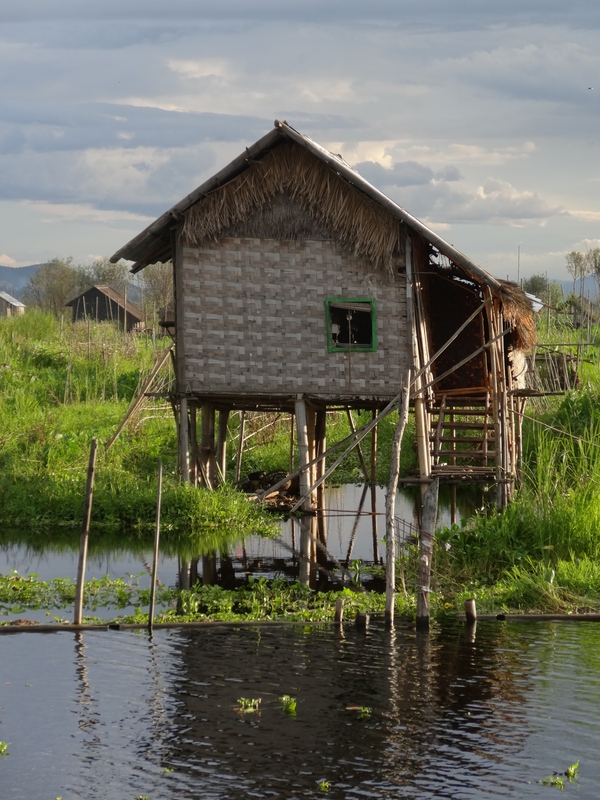 I still can’t decide if it was best to start here when I had no knowledge of SE Asia, or if I should have started elsewhere and then better appreciated the lack of development and friendly acceptance. I would be interested to return in a few years to see how the country has developed. I went to meet a contact for a coffee when I arrived back in Yangon and there was a large queue of people outside an electronics store. When I questioned what it was for, I was told that the government had just released another 300 or so SIM cards, so people were queuing to buy one. Such a world apart from ours where the queues would be for the latest iphone. The country still has a long way to go in terms of corruption and cronyism – but maybe that is inevitable at this point in time. More concerning is the ongoing questionable human rights record (we went past a building yesterday called “the Department of Special Investigations” which felt quite sinister given some of the stories that are told). I finished the book I referred to in one of my earlier posts – Burma’s Spring, and would recommend it to anyone interested in the country. From what I can tell, and from the people I have spoken with, the book is an accurate reflection of life in Burma over the last couple of decades and as the country progressed from junta rule to its current tentative steps towards democracy. As we left our guide thanked us for visiting, for the employment opportunity this increase in tourism is bringing to local economies. Overall, the sense I was left with was of cautious optimism, and a reason to believe in a more democratic and prosperous future. But there is a long way to come and only this morning I saw a piece on Aung San Suu Kyi expressing concern that progress had stalled. On the flip side, it reminded me that I should be appreciative of what we have back home – running water, toilets with seats (still can’t cope with the squat) reliable electricity, education for all, freedom of speech, a democracy (some may say not…but we don’t rig elections or write it into the constitution that you can’t lead the country if your husband or children are not from Burma, just to ensure that certain people can’t become president). The country and its situation both fascinated and greatly touched me and I will follow its development with interest. As I travelled to the airport, there was much traffic and a heavy police presence – luckily no need to overthink that one – I was not being chased out of town for expressing my views, rather a certain Mr Obama was coming to visit imminently!